A popular mystery book for book clubs! Held rank of #5 in the Nook Store and #30 on Amazon Kindle, and was a GalleyCat Barnes & Noble Bestseller and GalleyCat Mystery and Thriller Bestseller. Twenty-Five Years Ago Today is available in multiple e-book formats and as an audiobook. The paperback edition is temporarily out of print, but check back for updates. Get in on the secret – join thousands of readers in discovering who killed Diana Ferguson. Not only does Kris face resistance from her family and her managing editor, she also clashes with Diana’s suspicious nephew, Eric Soares – until neither she nor Eric can deny the chemistry flaring between them. 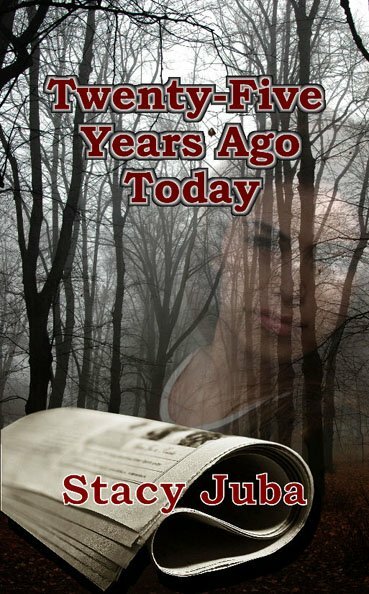 She soon learns that old news never leaves the morgue and that yesterday’s headline is tomorrow’s danger, for finding out the truth about that night twenty-five years ago may shatter Kris’s present, costing her love, her career, and ultimately, her life. Get in on the secret – join thousands of readers in discovering who killed Diana Ferguson in this bestselling New England mystery that blends family drama, art, romance, and mythology into one suspenseful tale. Book 1 of the Young Ladies of Mystery Series – each novel is a standalone, but shares a common theme of young women thrust into a world of danger and mystery in small town New England. $3.99 and up e-book versions available from: Please note that this title is exclusively available on Amazon for a limited time. The below links at non-Amazon retailers are temporarily unavailable. This book is also available as part of the Young Ladies of Mystery Boxed Set, which features three suspenseful novels in one download. Get free sample chapters from three mystery novels. You will also receive a behind-the-scenes glimpse of Stacy’s mystery writing, surprise bonus content, book release news, and perks for readers included in your subscription. Get free sample chapters from three mystery novels! You will also receive a behind-the-scenes glimpse of Stacy’s mystery writing, surprise bonus content, book release news, and perks for readers included in your subscription.